This T-Leg Ironing Board from Homz is the essential tool to keep all of your garments pressed and ironed. 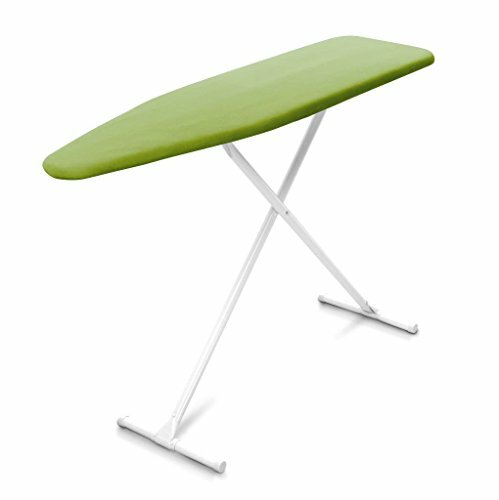 With its 53" long and 13" wide ironing top, the board provides ample of space for garments of all sizes. Underneath the surface, you will find a foam pad, over which there is a tightly countoured cover, made out of 100% cotton. The ironing board easily adjusts to any height, up to 35" tall. A sturdy, riveted, durable metal T-leg provides rigidity when the board is in use. The patented leg lock design allows to easily collapse and transport securely when the board is not in use. This combination will ensure you look your best when you are wearing your favorite clothes! If you have any questions about this product by HOMZ, contact us by completing and submitting the form below. If you are looking for a specif part number, please include it with your message.